Ian Crockatt launches his new collection of translations of the poetry of Rognvaldr, published by Arc. 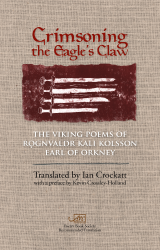 A genuinely unique European treasure, this volume bristles with all 33 of Rognvaldr's verses from the Orkneyinga Saga. While full of highly stylised, often grotesque images, the poems convey the skill, vigour and daring of the original. Rich narratives and old Norse mythology blend with familiar place-names and landscapes to create a peculiarly alluring, sometimes comic, world that never quite settles around the reader, as if time travel is possible from a favourite armchair. Ian Crockatt lives with his ceramic artist wife Wenna on a small croft in the North-East of Scotland. He has published several collections of his own poetry, including Flood Alert (Chapman Publications, 1996), Original Myths (Cruachan Publications, 1999), The Crucifixion Bird (Northwords Folios, 2002), Blizzards of the Inner Eye (Peterloo Press, 2003), The Lyrical Beast (Salix Publications, 2004), and Skald: Viking Poems (Koo Press, Aberdeen, 2009, reprinted 2011). Original Myths, which includes etchings by the Scottish artist Paul Fleming, was nominated for the Saltire Society's Scottish Book of the Year Award in 2000. He has been a prize winner in a number of national literary competitions, and was awarded Writer's Bursaries by the Scottish Arts Council in 2004 and 2008. Pure Contradiction, his selection of translations of the poems of Rainer Maria Rilke (Arc Publications) was awarded the Society of Authors' Schlegel-Tieck prize in 2013. He recently completed a PhD thesis at the University of Aberdeen, focussing on the translation of Old Norse skaldic poetry. 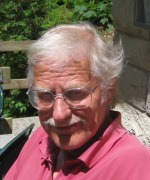 Listen to Ian Crockatt on the Literature Show talking about his work on 20 September 2014.